And You Can Get It In Any Color You Want. Click here for available colors. Click on any item for photo and details. but we do not recommend it on wheels. but we do not recommend it being stacked or on wheels. 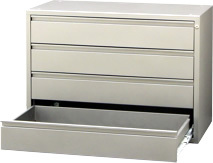 our 8", 9", and 12" drawers are the answer. 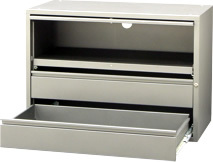 Whether you need storage for hanging files, tools, tape backups, or video tape, our extra tall drawers just make sense - and because they are part of our modular family of cabinets, they stack with or alongside all our standard cabinets. Go Configure! 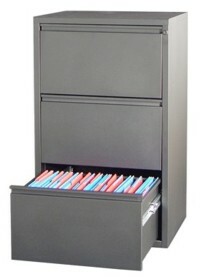 Get the file cabinet you want in the color you want. Unlike other cabinets in our offering, these cabinets are too large to ship by express ground service and ship by transport truck only. If your order includes either of these cabinets, please submit an order inquiry and we will determine the shipping costs and get back to you. out of sight when not in use. An optional key lock is also available. 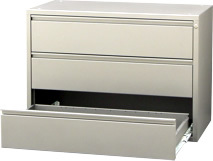 mini drawers. 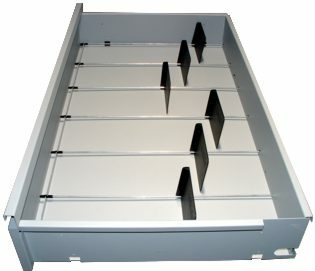 Among other things it has been used as an electronic parts cabinet in mobile installation vans. Go Configure. 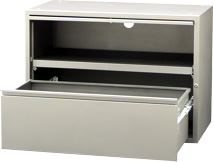 These cabinets combine the best of our drawer storage cabinets with flip-door storage for components, peripherals, or whatever equipment you might need to have close at hand - but would want to have locked away dust-free and out of sight when not in use. 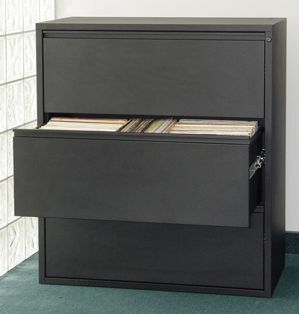 Add a unique storage opportunity to your configuration. Also featuring a wireway, to help keep you connected. 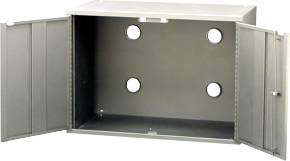 Our wiring holes feature a plastic ring to protect your cables from chafing. If you don't need a wireway on the back of your cabinet, just request a bushing cap. The	cap	replaces the plastic ring and simply snaps	into	place	to	cover	the wiring hole. accept our optional shelves and mini drawers. 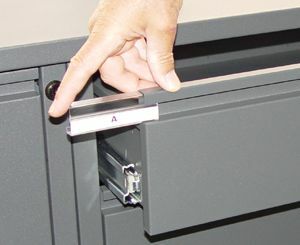 Sliders or brackets snap into slots in the cabinet, shelves and drawers snap onto the sliders or brackets. Shelves And Drawers Are Sold Separately. 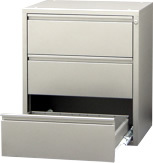 FCAB20D and CAB20D both accept our standard width shelves and drawers - ASHELF, PUSHE, and MINIDRW. 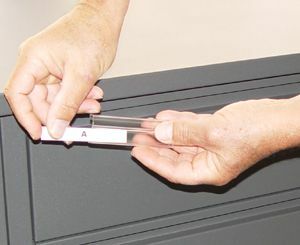 The shelves and drawers do not extend all the way to the back of the cabinet, so you have plenty of room to run your cables down to the wiring holes at the bottom of the cabinet. Having the wiring holes at the bottom also allows this cabinet to be wall mounted. We took our CAB20 body and added a rear extension, to accommodate large equipment and related wiring. 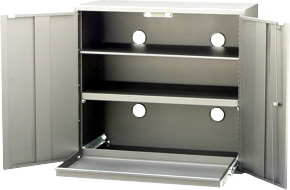 The cabinets will stack and configure seamlessly with standard depth Can-Am cabinets. 22 inches of depth in the Flip-door model FCAB20D. A bit more in the open model CAB20D. The cabinet features 3 wire-ways at the bottom of the extension, allowing it to be placed up against a wall. 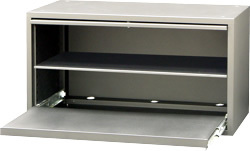 Mica Tops are custom fitted to our cabinets, and add 1" in height to your configuration. 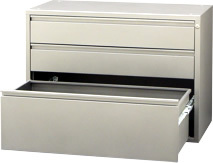 Set it on top of any Two 27" Narrow Cabinets on Legs for the ultimate desk. 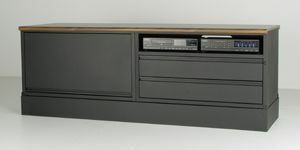 It can also be used over two Standard Cabinets to form a bar style setup. to match or complement your cabinets perfectly. Our Metal Table Top features a one inch overhang on all sides, and is used with cabinets or stacks of cabinets placed back-to-back. 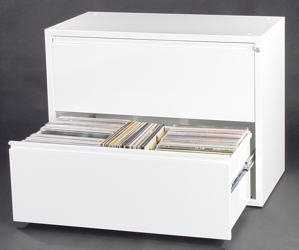 Simply place the top over your cabinets for a snug fit that adds virtually no height to the setup. Whether you are looking to create a coffee table with incredible storage opportunities, or the ultimate 'island' style setup, this is your top. 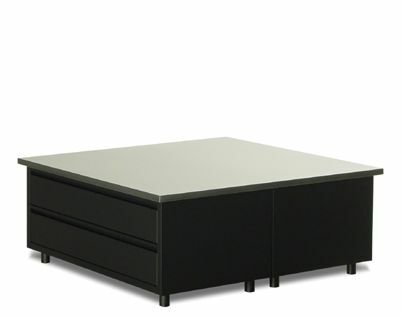 Set it on top of two standard width cabinets back-to-back for a coffee table with incredible storage opportunities. Or go higher, stacking four, or even six cabinets, to create an island. 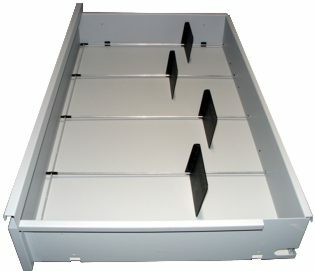 Tons of surface area, and you choose the type of storage below. (Top is form fitted and features a 1" perimeter lip on all sides). Available at 2", 3", 4", 5" and 6"
you should use a heavy-duty caddy. 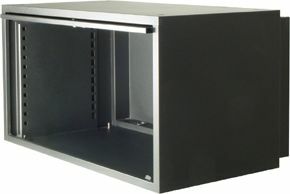 For one standard width cabinet. For narrow cabinets side by side. 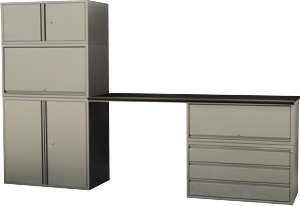 For standard width cabinets side by side. 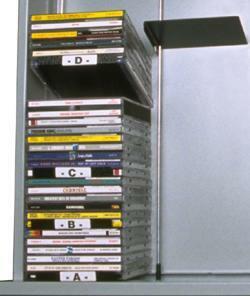 The dividers create 6 rows for CDs or 4 rows for DVDs, Blu-ray or VHS movies. Blank labels are included with each label holder, and a preprinted set with alphabetic and months are included with each set of 12. You can also laser print your own labels. Can-Am Label Holders will work with Avery 1/2" Binder Spine Inserts (Avery # 89101), readily available in most office supply stores. 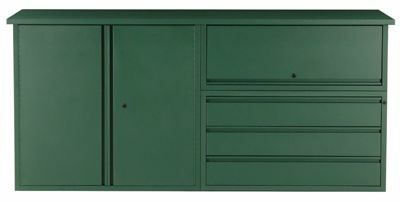 Now that you've seen our line-up of modular cabinets, feel free to configure them anyway you like! sample configs and our most popular setups - priced out and ready to order!